Several years ago, NASA’s Fermi Gamma-ray space telescope discovered Terrestrial Gamma-Ray Flashes (TGF’s), mysterious burst of high-energy gamma radiation emanating from the Earth’s upper atmosphere. Later observations by Fermi revealed that the TGF’s are caused by streams of anti-matter annihilating atoms of regular matter in the upper atmosphere, and that these anti-matter particles are created high above ordinary storm clouds by bolts of lightning. Fermi is a space telescope, similar to Hubble, but can only see in the gamma radiation. 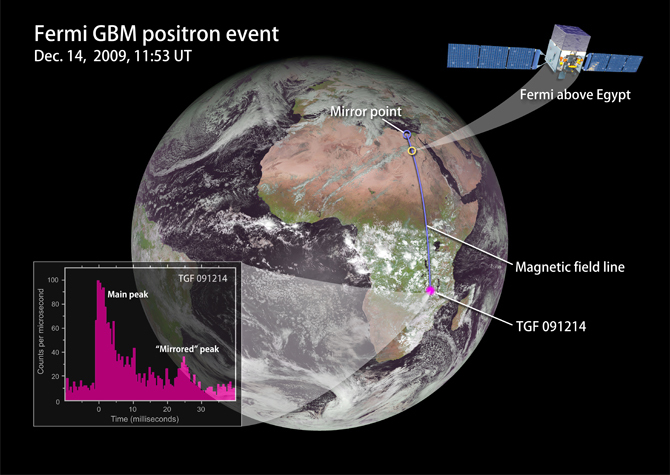 One of the instruments it carries is the Gamma-ray Burst Monitor (GBM), which was intended to find and study mysterious short-lived burst of gamma radiation from space, but has turned out to be very useful for studying TGF’s as well. 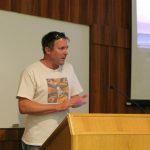 Recent software upgrades to the GBM have improved its sensitivity allowing a ten-fold improvement in the data it can collect. This is important as TGF’s typically only last a few thousandths of a second. With the upgrades, Fermi is expected to be able to capture 850 TGF events per year, although this is still only a tiny fraction of the thousands that are now known to occur every single day!